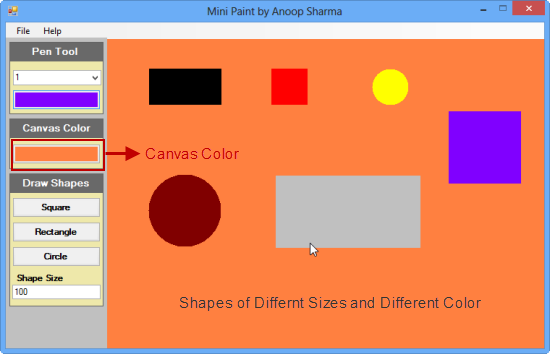 In this Article, I am going to show you How to create Mini Paint Application using C# Windows Form Application . 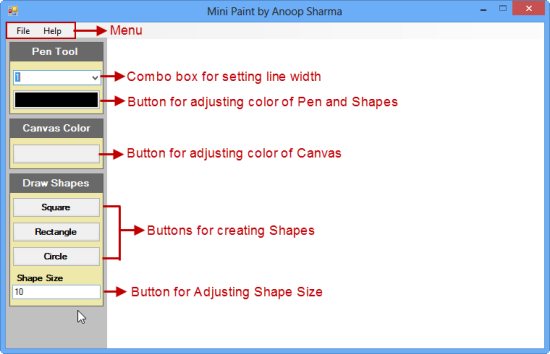 I am going to show some basic features of Paint Application. Before starting, I Hope you have the Basic Knowledge of GDI+ Graphics Functionality. I have added comments in the Code so that you can easily understand the code. //Event fired when the mouse pointer is moved over the Panel(pnl_Draw). //setting the width and height same for creating square. //setting startPaint and drawSquare value to false for creating one graphic on one click. //Fired when the mouse pointer is over the pnl_Draw and a mouse button is released.